Polenta ‘pizza’ with cherry tomatoes and some sort of cheesy topping. This is not, of course, pizza. But it is delicious. Polenta featured large in my father’s home cuisine – northern Italy. But it didn’t feature in my mum’s – southern Italy. And because my mum was the cook when we were growing up, I feel I can safely say we never had polenta. I would hear about it, but I could not get my head around what it was. Sometimes it was a powder, then it was solid, then like mash. When I got older I tried making polenta and it was a disaster. Since then things have improved and it features in my home cuisine and I always find it comforting. This recipe is from Delicious magazine. I like that the making of the polenta doesn’t involve loads of butter and parmesan – sometimes you want that, but not all the time. Of course you can vary the topping to have what you want on it. Because my children aren’t so keen on dolcelatte I bought some brie with truffles in it as a treat. Anyway this is just delicious. It easily fed four of us and I had the left overs for lunch the next day (heat up for a few minutes in a dry frying pan, if you can cover it to catch the steam) and it was wonderful. Heat the oven to 200C. Spread the courgettes and tomatoes over a large baking tin, drizzle with the oil, season with salt and peper and roast for 10 minutes. This bit is important as you won’t be cooking the finished pizza for long enough to get the courgettes and tomatoes sufficiently roasted. When done set aside but leave the oven on. Meanwhile, put the milk and stock in a large sauce pan and bring to the boil. Put the polenta in a jug and when the liquid boils, pour the polenta in a stream and stir continuously with a wooden spoon or large whisk. You want the mixture to thicken and bubble on the surface, like larva. Now turn down the heat and stir in the cheddar and season well. Pour the polenta mixture onto a baking sheet (I find some baking parchment helps but is not essential), spread out thinly to a circular or rectangular shape. Spread the passata over – it will be very thin. Top with the roasted courgettes/tomatoes and the thin slices of cheese. Bake for 15-20 minutes until golden. Scatter basil leaves atop. You can serve this with a salad but I like it on its own, with one fork, and my feet up on the sofa. This entry was posted in Cakes, Gluten-free, Healthy, What's for lunch?, Wheat free and tagged Italy., lunch, pizza, polenta on November 13, 2016 by Annalisa Barbieri. This isn’t anything like a pizza. I warn you now. But if, as I do, you like to have a lunch with a ‘base’ and lots of veg then this is a really good, gluten-free, wheat-free and tasty (yes really) offering. To me, it didn’t taste like cauliflower at all, more like a lovely parmesan crust. My partner was a veggie for 20 years; he views such things with deep suspicion, having been offered beans, made into the shape of a lacklustre burger for many years. But he was impressed and delighted. I got the recipe from Delicious Magazine (no link because it doesn’t appear to be online), and I’ve halved the ingredients to make it ideal for two, for lunch. I followed the recipe topping but obviously you can add whatever you want. We happened to have some pesto made by my eldest (she makes it better than I do, taking it off me and saying “here Mummy, let me show you”. I love how she is confident like this). You could, feasibly, leave the pesto out and add a drizzle of olive oil or chilli oil, or just, you know, BUY SOME. Heat the oven to 200C and put in a large baking sheet. Now, put the florets in a food processor and blitz so it looks like cous cous. Put in a bowl and add the egg (which you have lightly beaten), ground almonds, parmesan and a bit of salt and pepper (not too much salt as the parmesan is also salty). Stir together. On a piece of baking parchment, spoon out two portions. I sort of shaped it by hand, into two round shapes. It was easy, no rolling and although the mixture is wet and you think it won’t work, it does. When you’ve done this, take out the baking sheet (which will be hot!) and gently slide the baking parchment onto the baking sheet. Cook for about 20 minutes or until golden and firm to the touch. Check after 15 minutes. Whilst that’s cooking, slice the courgette into ribbons. When the bases are cooked, take out and keeping them on the baking sheet, scatter over the ricotta, courgette and ham. Cook for another five minutes and then, spoon a bit of pesto and scatter some mint leaves atop. 2016 update: I just love this dish. What I tend to do is spread a thin layer of chilli jam/caramelised onion/chorizo jam over the base, then layer on the courgette and ricotta but also add (ssssh) some slices of chorizo, which I love. This really is tasty! When it’s cooked I drizzle on some olive oil (extra virgin). This entry was posted in Gluten-free, What's for lunch?, Wheat free and tagged cauliflower crust, cauliflower florets, courgette, gluten free, healthy lunch, pizza on September 19, 2014 by Annalisa Barbieri. This isn’t sourdough, and it’s a bread machine recipe. 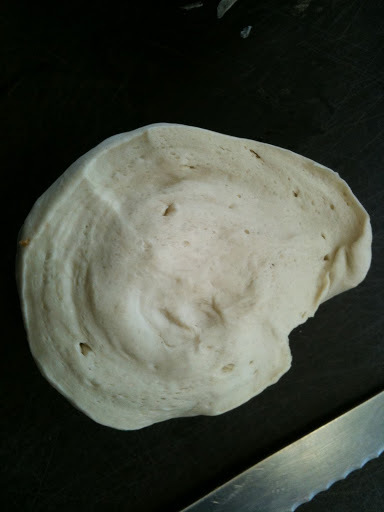 But it’s a lovely pizza dough, and one which Pete, my partner, has perfected over the years. I don’t understand people who ooh-ahh over the fact that we make our own pizzas. It’s simplicity itself and you can make them in advance. I make these in two Mermaid trays – but I like them thin. If you like your pizzas thick well, I’m not sure I have much to say to you really. Pizzas shouldn’t be thick. From start to finish you can have pizzas on the table in about fifty-five minutes. The pizza-dough cycle on my bread machine takes 40 mins, then you just roll out, put toppings on and they’re cooked in 8-10 mins. And for those of you who have children, this is a lovely thing to get them involved in. When it’s done, oil a suitable surface (I use a very large chopping board so that I can move it about if need be) and your hands, and take the dough out. Sometimes this dough is really sticky, other times more manageable. It makes for a better dough when it’s stickier (higher hydration) so there is a compensation. Because I use the dough across two baking trays, I cut mine in half; but if you’re making – say – four round pizzas, cut into four..etc. I’m sure you can work it out.. Roll out the dough, as thin as you can, to fit your tray/tin. If you can do that thing of throwing the dough up in the air to make it thin, great: do teach me how to do it too! When it’s rolled out to an approximate size, I lay it on the tray (note: I oil the tray and coat it with polenta/cornmeal), rest if for five mins and then stretch it into the corners/sides. Now you can, at this stage, go straight into doing the toppings and either cook it or put it in the fridge (naked or with all the toppings on, I put mine in naked). You can also freeze it (in which case cook straight from frozen, just give it a few more mins). I cover mine with cling film place one tray on top of another (if no toppings on) to save space in the fridge. When you’re ready to cook, if you haven’t already, put on whatever toppings you want. For the tomato bit on the top, I use Waitrose Sundried Tomato paste – a tiny amount spread on the pizza base (it’s quite salty so go carefully). 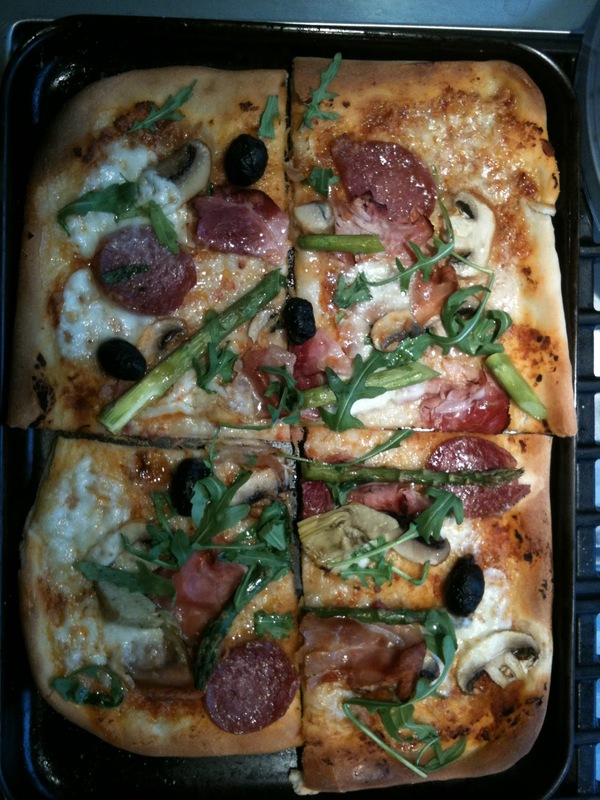 Then I put on artichoke hearts, salami slices, olives, ham, mushrooms, mozzarella, asparagus if in season etc. Or just the tomato paste and some mozzarella for those who like it really simple (boring..) Just before it goes into the oven, splash some olive oil on it and cook it for 7-10 mins. My oven is very hot and has a pizza setting, yours might too. You can tell when it’s done as it will have bubbled up and be golden. Take out and slide onto a chopping board, slice up, eat and feel very virtuous. Pizza doesn’t have to be unhealthy..or at least whilst not pretending this is a health food, it’s as healthy as pizza can be. This entry was posted in Bread, Children, What's for dinner? and tagged Pete's pizza dough, pizza on March 28, 2011 by Annalisa Barbieri.